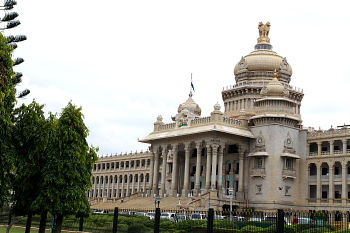 Bangalore, situated at South West direction, capital of Karnataka, is popularly recognized as the Garden city. This was founded by Kempegowda of Magadi during 1537 AD. The original name was Benda Kaluru (means, boiled grains). The name has been changed recently as Bengaluru in view of this history. The city has emerged as the number one hub for Information Technology. Bangalore has also become an industrial area with huge investments from many industrialists. The place has importance also towards business, education and health. Famous for old trees, rare flowers and plants. Annually there will be a show on vegetables, flowers and fruits. The entry fee person is INR 10. Additional charges for vehicles. Car INR 10, Bus INR 80, Temp INR 30, Bike INR 5. Lalbagh is a famous for Bangalore residents for walking. But the time is restricted as 6.00am to 9.00am and 5.30pm to 7.00pm. The Glass house is the additional attraction in Lalbagh. There is an exclusive band stand inside the park. The show is from 5.00pm to 6.00pm on second Saturday and 6.00am to 8.00am on all Sundays. Located at Basavangudi. This is built using Dravidian style of architecture. The bull is 6mts long and 4.5mts hight. River Vrishabhavati originates at the pedestal of Nandi (Bull) and flows towards West to meet Arakavati river at Kanakapura. Once in a year During November (karthika maasam, last Monday and Tuesday) there will be a Groundnut Fair in this temple called Kadalekayi Parishe). Beside the Bull temple, there is Lord Ganesha temple. The temple is locally called as Dodda Ganapathi temple. This is a Historical mudfort. Originally constructed by Kempegowda, rebuilt by Haidar later and further improved by Tipu Sultan. The Tipu Sultan palace was started by Hyder Ali during 1781 AD and completed by Tippu Sultan during 1791 AD. The palace is constructed with wood and stones. Situated in the city premises and nearer to Vidhana Soudha. This palace is under the private custody of Sreekantadatha Narasimha Raja Wodeyar. Entry timings are from 9.00am to 6.00pm. Entry fees INR 100 for Indian citizens. Photography is allowed inside the palace. Still camera INR 500 and Video camera fee INR 1000. Inside the museum there are models which demonstrates the principles of basic science and techonlogy. There are four floors and each floor houses a different kind of exhibition. In ground floor, there are engines which existed during olden days. In one room, there is a Dinosaur model with a little action. In first floor, there is fun science with Electronic technique. In the second floor, space emerging and Bio Technological related models are shown. There is a 3D theatre and there will be show at 11.30am, 12.15pm, 1.45pm, 2.30pm, 3.15pm, 4.00pm and 4.45pm. Entry fee is INR 20 for individual and INR 10 for school, college and other institutions. Fourth floor is having a Cafeteria. Gents and ladies toilets are situated alternatively in each floor. Situated near Kasturba road. There will be a 45 minutes show about Astro physics. Entry fee is INR 20 per head. This is a very interesting place for children. This temple is dedicated to Lord Shiva and situated at Gavipuram. Cave means Gavi in Kannada. This temple is also known as Gavi Gangadhareshwara temple. There are parks nearer to Cave temple. These include Kempambudhi tank, Vrishabhavathi valley and Harihara rayana gudda park. Inside the cave, there are two paths which are believed that one goes towards Kashi and other towards Shiva Ganga. During Dhanurmasa period (December 15th to January 14th) puja timings are from 5.00am to 11.30 and from 5.00pm to 8.00pm. The temple main gate will be locked during other time. Visitors willing to see the temple inside, confirm the timings well in advance. Krishna temple, constructed by International Society of Krishna Consciousness (ISKCON). ISKON was started by Sri Srimad A.C.Bhakti Vedanta Swami Prabhupada. This is on a rocky hill near Chord road (Rajajinagar). Entry timings are 4.15am to 5.00am, 7.15am to 12.50pm, 4.00pm to 8.20pm. There are different entries for normal visitors and pass holders (Harinama Dwara). Path way with roof arrangement is made inside for secured and safe visit to the temple. Counters are available for foot wears, luggages and cameras. Visitors should get the receipt for each item they submit at the counter. Photography is not allowed inside the temple premises. If anybody is carrying any costly electronics gadgets, show the items to the person at the counter and get it mentioned in the receipt without forgetting. There are temples of Prahlada Narasimha and Srinivasa Govinda located on the way. There are seperate counter for puja material and prasadam. In the main temple, there are three sections, Sri Nitai Gauranga, Sri Radha Krishna Chandra, Sri Krishna Balarama. Special darshan available from 9.00am to 11.00pm during Vaikunta Ekadashi. There are Lecture halls and multivision cinema showing image animations for a duration of 20 minutes at the cost of INR 20 per head. Located at the outskirts of the city. There is a natural island in the mid of the lake. This is a picnin spot with boating facility. Someshwar temple at Ulsoor, Mallikarjuna Swamy temple in Malleswaram, Banashankari temple at Kanakapura road, Subramanya and Kannika parameshwari temples at Visweshwarapuram and Ragi Gudda Anjaneya temple. All Saints Church, Infant Jesus Church, St.Marys Cathedral church, East Parade church (called as the mother of Churches in Karnataka) and Sacred Heart Church. Jumma Masjid (Old Poor House street), Jami Masjid (city market), Military Masjid (St.Johns road), The Parsi Fire temple (Queen's road), Sikh Gurudwara (Kensington road) and shrine in Jayanagar. There is a Buddhist temple at Gandhinagar constructed by Maha Bodhi Society founded by Acharya Buddha Rakhita during 1956. A famous Jain temple is situated at Jayanagar which has excellent marble work. Some more Jain temples are situated at Chickpet, Gandhinagar and Sajjanrao circle. There are many tourist places around Bangalore with a maximum distance of 100Kms. Excellent transport facility is available at Bangalore city. Packages are available at a very nominal rates either through private operators or through KSTDC (karnataka State Tourism Development Corporation). 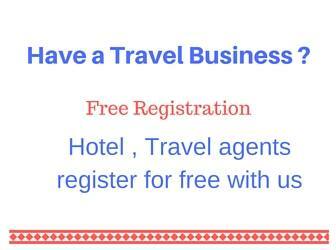 People can select their packages convenient to them related to number of days and place of stay. Below are the places of interest along with the distances between Bangalore and various places. Wildlife sanctuary,30 kms from Bangalore. Lion Safari available. Only 30kms away from Bangalore, huge banyan tree with roots spreading over two acres of area, picnic spot. 35Kms from Bangalore, built on river Arkavati, picnic and fishing spot. Also called Tippagondanahalli reservoir. 80 Kms from Bangalore. Lord Narasimha temple located on a hill. Naamada Chilume, spring water is located nearby. Good place for picnic and trekking. 80 kms from Bangalore, temples dedicated to Pandavas, pilgrim centre. Kaiwara Naranappa and Vishnu temple are situated here. Kanakapura is 65 kms from Bangalore. There are some beautiful places around kanakapura. Mekedatu is a picnic spot inside deep forest at the banks of river Kaveri. The river water floods through a narrow gap of stones. Fishing camp nearer to Mekedatu. 55Kms from Kanakapura via Sathanur. Muthathi forest, Lord Anjaneya temple. Bheemeshwari, also called Kaveri Fishing camp, is nearer to Muthathi.